Here's a new and unusual product I tried. 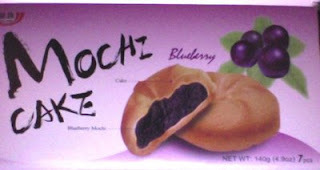 It has a blueberry jam filling, surrounded by a layer of mochi, and then a thin baked soft "cookie" crust. As with most desserts and snacks tailored for Asian tastes, it wasn't overly sweet. But not much blueberry flavor, either. Interesting, though.